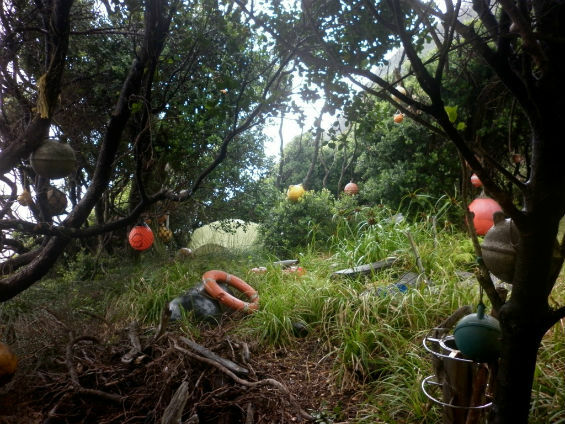 Artist and conservation volunteer Eleanor Cooper has created an exhibition of sculptures inspired by her time on Raoul Island. It is crazy to think that the Scottish pirates from the RV Braveheart—parading themselves as GNS workers and boat crew—were our first contact with people, outside our small team, in four months! The scientists and divers from GNS were up here fixing their tsunami reader and checking over their gear on the island. The trip was combined with a research expedition with Dr Tom Trnski, from Auckland Museum, and Steve Hathaway, an underwater videographer. 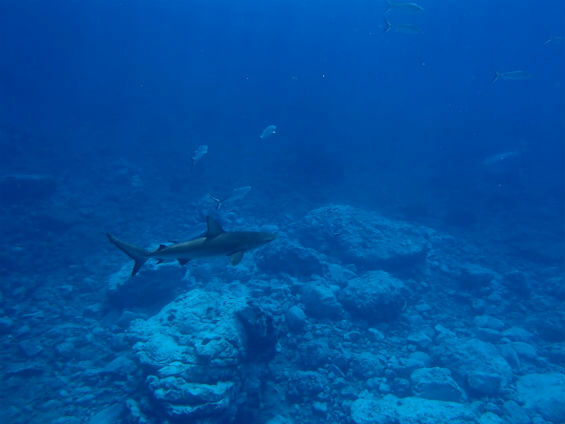 Check out the blog of their trip, it has some amazing footage from the Kermadec Islands. In preparation for our guests, we slogged away getting everything just right. Lawns were mowed, wood cut for the BBQ, the Ranch cleaned and sparkling. All was set. Now we just had to wait. I don’t know if other ex-Raoulies got this feeling while they were up here, but every now and then I get the vibe that the island enjoys tormenting us. True to form, a few days before the arrival of our guests, the rain begins. Torrential. Non-stop. Rain. 102.5 mm over two days. Everything was wet. Everything was muddy. Good times. Then, just for a bit of extra excitement, a water main to the house breaks. Figuring losing one tank of water was child’s play, we opted to drain them both. That’s 60,000 litres of water seeping into the ground. Now, if this had happened two days earlier, finding the leak would have been easy—the wet spot would’ve been obvious in the dry. Unfortunately, the entire island was a wet spot—it also has very permeable and quick draining soil. This meant the job continued on over many hours (days)—digging in mud. In the rain. Always with the rain. Let me tell you, water out of a tap is a luxury! I will never again take that for granted. Using buckets from the fire reservoir for flushing toilets and hiking up the hill to fill containers for drinking was not fun. So, wet muddy clothes we had been wearing for a week and no showers was how we greeted our visitors to the island. 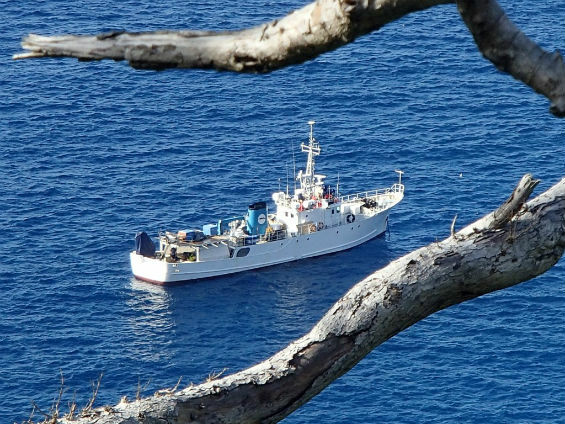 I am not 100% sure, but it may have been the sight and smell of us that made them only stay ashore one night and then flee back to the comforts of their ship. All good though! The island did a complete turn around and the day they came ashore was sunny and perfect. A lot of merriment and cups of tea were had by all and it was a great visit by a nice bunch of people. It is not all work work work however, despite what it may sound like. Boss man Neil does occasionally let us off the leash and allow us a few hours of free time for exploring. Labour Weekend at Sunshine Camp was the setting for an adventure for Ross, Jenny and myself. Looking back now it feels like a Tui ad waiting to happen and I can actually laugh at the irony. 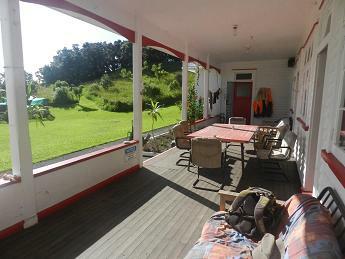 A weekend camping + a place called Sunshine + Labour Weekend in New Zealand = non stop rainy good times. Actually I shouldn’t complain. We left home in brilliant sunshine and had it beaming down on us while we staggered there with full packs. It only started to cloud over as we arrived. And, even then, the rain held off until we were tucked up in our tents. The plan for a second night quickly changed to a wet muddy slog back to the Ranch though. I cannot deny it, I am a fair weather camper. There are so many places to go and things to see here. The humpbacks had gone, but their departure coincided with the arrival of a seabird bonanza. Amazing birds and strange noises became the norm—it’s like a whole new channel on Raoul TV. Tam and I spent a night camping out on Hutchies Bluff a few weeks ago and got to experience a pod of dolphins cruising past, with one of the humpback stragglers and her wee calf. The sun was setting directly in front of us, there were seabirds galore, and a full moon rising behind us. It was one of those moments when you pinch yourself and think, ‘wait this is my job?’! Snorkelling here is epic. The water is so clear, visibility is amazing, and the fish! Schools of kahawai follow you around, tiny mimic blennies nibble your legs, mado, lion fish (definitely no touching those suckers), giant limpets the size of your hands, the noise of kina crunching away on the rocks. 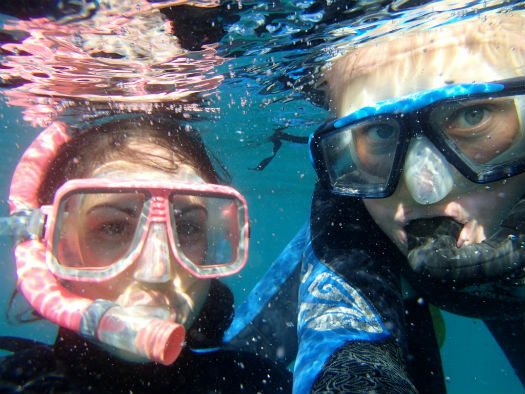 Snorkelling selfie (me on left)! Neil saw a kingi as big as himself (not a lot is as big as Captain Longshanks, so that is saying something). It is all a bit overwhelming really. Last week I saw a turtle and had my first snorkel with the sharks experience. It was only a small one, but seriously, 1 metre looks massive underwater. Yes, I did use Tam as a human shield, but I stayed in the water! Big ups to me. Cue scary music … it’s Jaws! 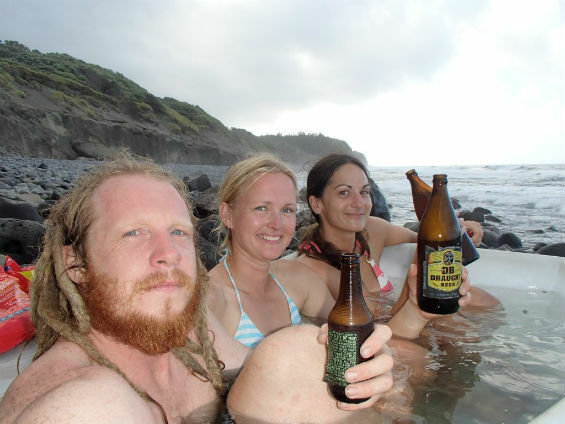 Tam, Neil and I decided that our first weekend, post pirate invasion, we should chill and have a relaxing visit to the Oneraki Beach Day Spa to recharge. I really cannot think of a better way to round off a weekend than chilling in a hot tub, sipping on my home brew ginger beer with my Raoul family. The rates at the spa are fab, and the view immense. Life is good. Home is beautiful. DOC is currently recruiting for volunteers for August 2014 to February 2015 now. See www.doc.govt.nz/raoulvolunteers for more information. 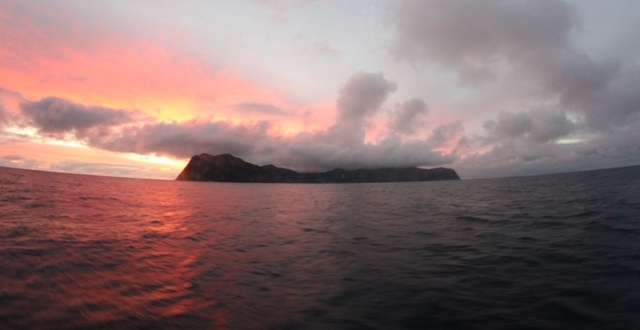 Today we profile Neil Forrester, Team Leader on Raoul Island in the Kermadec Islands. Some things I do in my job include… The core work on the island involves ridding the island of pest plant species, which is done by grid searching areas of known infestations to hunt down the villains and remove them once located. We collect and propagate seeds of some of the ‘At risk’ species to release back into their natural habitat with hopes they repopulate the island. I conduct rodent monitoring to ensure the rodent free status of the island is up held. I keeping walking tracks and roads open so we are able to travel around—vegetation grows very quickly up here so it is a constant battle! I also release weather balloons daily and record sunlight hours for the Met Service, take water samples from the caldera for GNS, and take air samples for SCRIPPS (Institution of Oceanograhy). We maintain the buildings and equipment and man the most northern part of New Zealand to protect it from pirates and other undesirables. This helps achieve DOC’s vision by… protecting and enhancing the values of the island and ensuring it stays rodent free, thus allowing the once decimated bird populations to recover. The best bit about my job is… everything. I get to live and work in paradise! Becoming part of Raoul history, working with a great bunch of people who love what they do and enjoying the banter on a daily basis with no mobile phone reception or shops. Bliss! The awesome-est DOC moment I’ve had so far is… I guess getting to work on the Poor Knights Islands after spending so long only getting to see it from water level, and yes it is one of the most awesome-est places ever. Especially with the guys I got to spend it with, plus I scored a chopper ride off on my last trip there. What a way to end (I should thank Graham Taylor for that one). The DOC (or previous DOC) employee that inspires or enthuses me most is… all DOC staff who are passionate about what they do and do it for the love of the job rather than the money they earn. My hat goes off to you all. Without all the hard work that everyone does, New Zealand would be a very different place. The song that always cheers me up is… anything by Manu Chao. If you have not heard of them, get some and enjoy!!! My greatest sporting moment was when…ever I get in the water to go surfing—and the waves aren’t bad up here either. 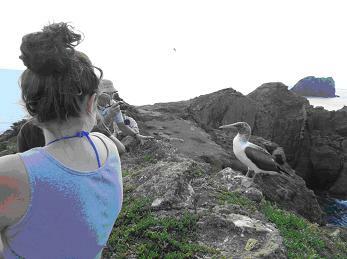 In my spare time I… surf, snorkel, explore the island and take photographs. My secret indulgence is… branston pickle. No cheese sandwich is complete without it but most people who know me will know that! 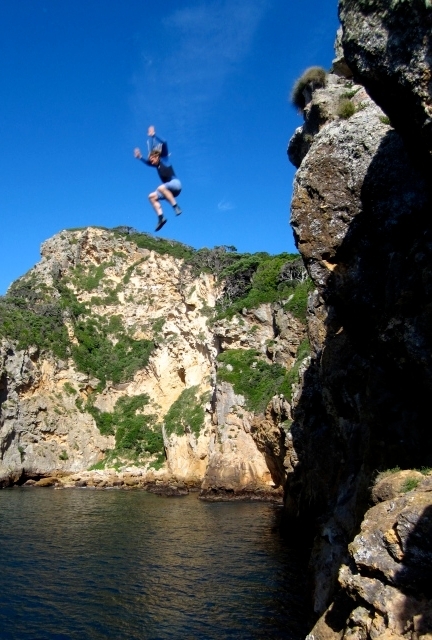 Before working at DOC I… was a diving instructor on Poor Knights Island. My favourite quote is… Love the life you live, live the life you love (Bob Marley). The best piece of advice I’ve ever been given is… just give it your best and always have fun! In work and life I am motivated by… fun. Everything in life should have a little fun associated with it. My conservation advice to New Zealanders is… try to protect what we have today so we can enjoy it tomorrow and the day after. Even if whatever you do is something small, it all makes a difference. You are about to be stranded on a deserted island, what three items will you take with you? 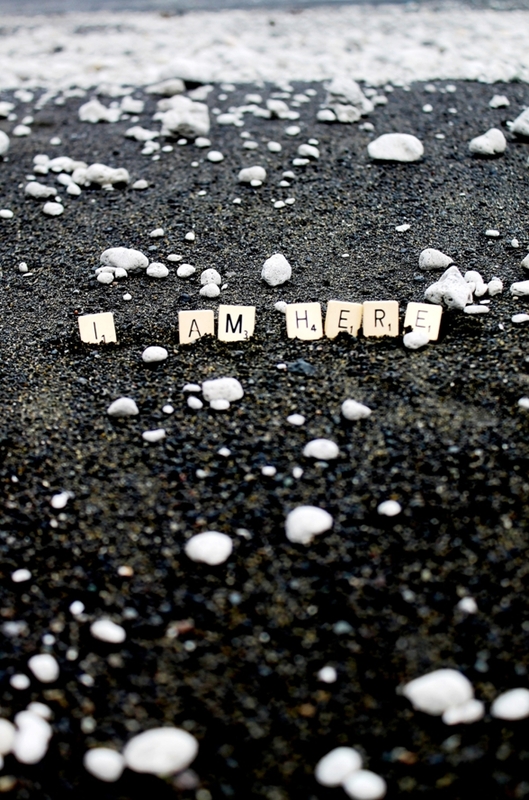 Firstly, I already am stranded on a kind of deserted island – there are only five of us. 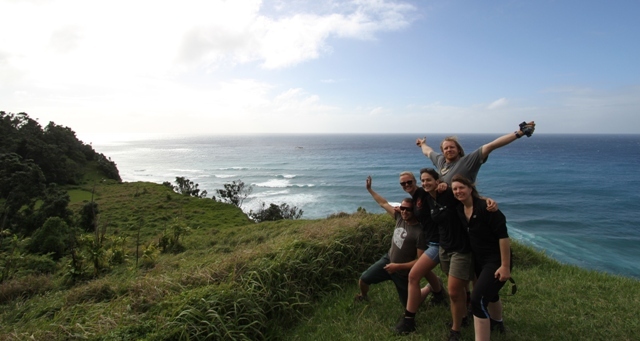 The memories I have of Raoul Island are going to keep me smiling for a long, long time. Being a Department of Conservation (DOC) volunteer for six months was a fantastic opportunity to learn about and explore the remote rock, and meet some awesome people in the process. 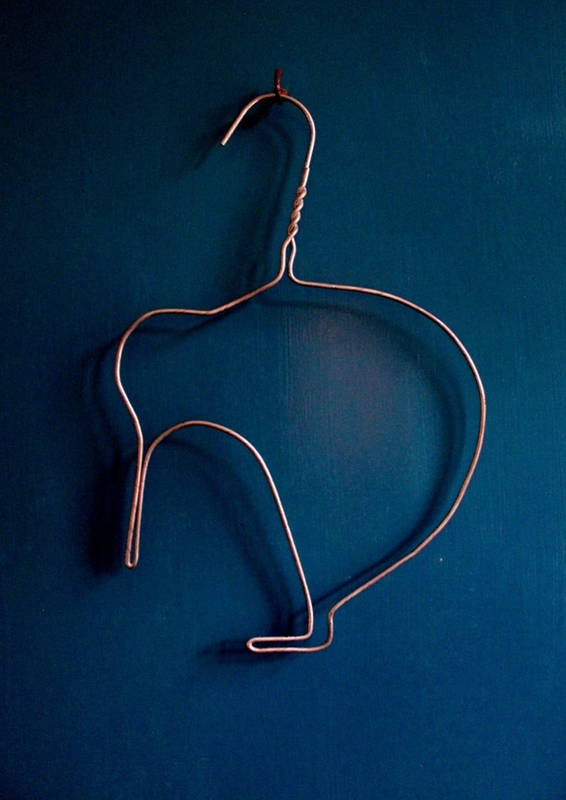 From bird life to hostel life, there were loads of wonderful and inspirational things to stimulate creativity. There is a lot of history in the hostel and library, and also in the books and relics that can be found in the huts dotted around the island. Weeding was our core purpose, and the biggest chunk of our week was spent in the bush hunting for rogue plants. The weekends allowed us free time to go adventuring and enjoy our own activities. I really appreciated being so far removed from the mainland and the sense of freedom it allowed. The absence of shops meant we were able to embrace the good old kiwi mentality of making the most out of what was at hand and, for once, money was not an issue! The bush and the bird life are glorious on Raoul, and a trip to weed the Meyer Islands was a treat, as there are a large number of birds nesting there, including tropicbirds, petrels, terns and boobies! It was a delight to be able to get so close to such magnificent creatures. 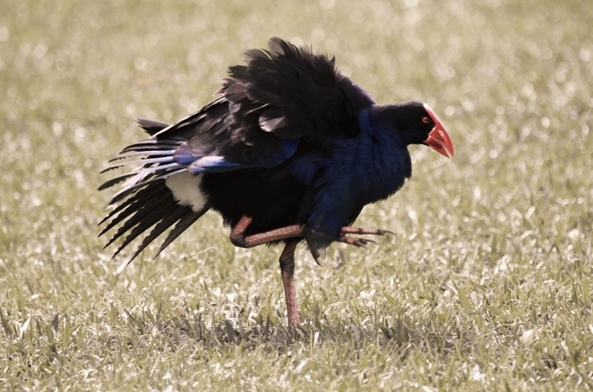 There are tui, kakariki, and also a few families of cheeky pukeko living around the hostel. They graze the lawn and wake the entire population of the island with their lovely call—sounding something like a seagull getting strangled with a potato chip still in its mouth. I took to walking around with a stick during nesting, not so that I could whack them, just so I could scare them away when they decided to attack! From an artist’s perspective, being surrounded by nature and not a lot else, gave me the space to be creative and think about the relevance of my work and the way I produce it. Using my camera to document, I enjoyed taking photographs of things as I found them—or of things that I had made, that did not permanently alter or harm the environment. Humour has always been a big part of my artwork and I have fun placing things out of context to create alternative meanings, sometimes using playful imagery to discuss more serious ideas. An environment such as Raoul makes it impossible not to see the inevitable impact that we humans have on nature. It was hard to leave the Island the when the time came, but I am extraordinarily grateful to be able to have gone, and to have gained the knowledge and experience it gave me. I hope very much to go back there someday. More photos of my time there can be seen on my artist page on Facebook. Raoul is the largest island in the Kermadec Islands Nature Reserve—a chain of islands lying some 1000 kilometres northeast of New Zealand. 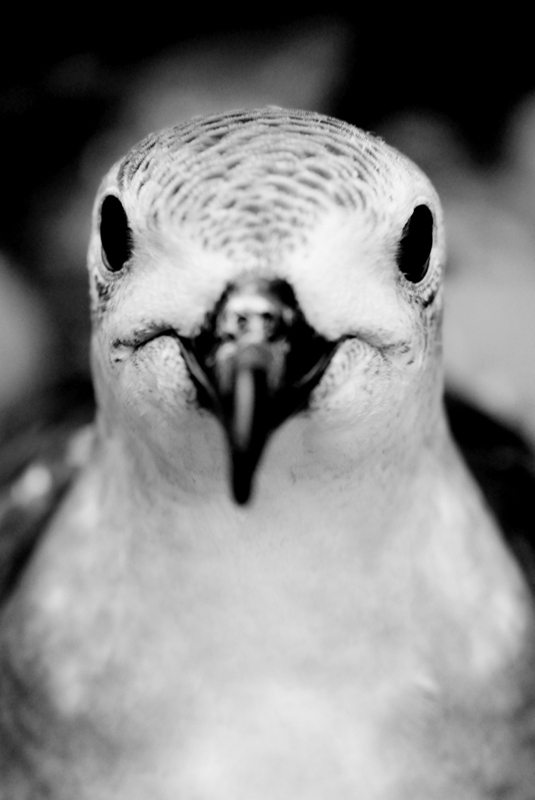 All the islands of the Kermadec group are part of the specially protected reserve. 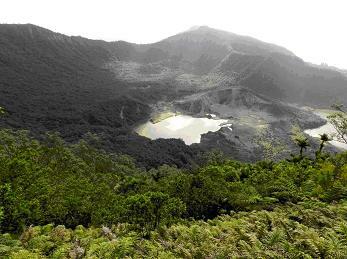 It is the most remote conservation area managed by the Department of Conservation. 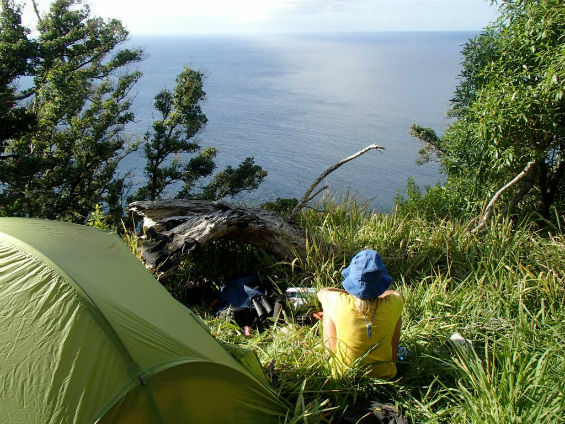 Raoul Island is one of the Kermadec Islands, about 1000km north-east of New Zealand in the South Pacific Ocean. 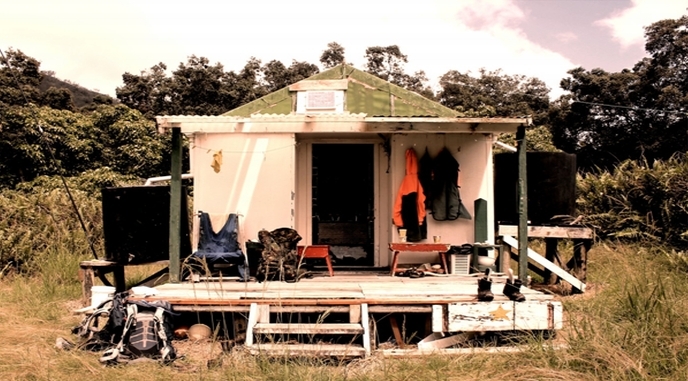 DOC have a small team of staff and volunteers who live on the island in relative solitude. Their main focus is controlling weeds on the island, maintaining infrastructure such as buildings, roads and tracks, and carrying out work for Met Service and GNS. 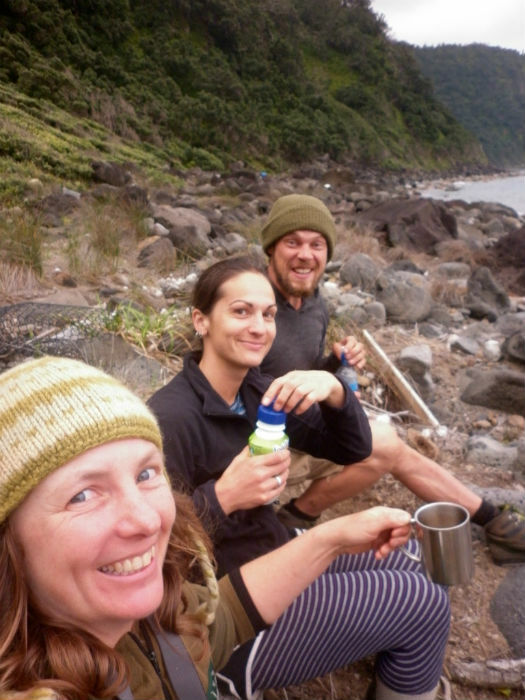 Since the island is so remote, we get these diary entries from the team and post them up on their behalf. Today’s diary is by volunteer Prue Fairbrass. 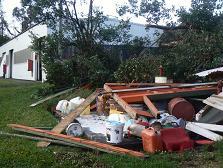 Today I am going to tell you about our cyclone in June which, according to the weather office was NOT a cyclone, just a deep depression. Well, it was so deep it has made a complete mess of everything here. Trees are down in every available and unavailable space – on tracks, sheds and roads. 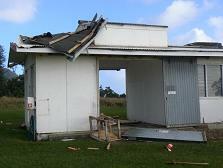 The ‘bomb’ shed where the weather balloons are sent from is now an open air, roofless, door-less structure. 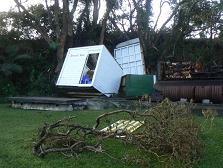 The fire shed lost its roof and side and was tipped over, and the fuel shed is no more. We were trapped in the hostel area with tree fall, some of which we have managed to clear, but it will take months to get it all back to normal. We have no way of getting off the island at present until Fishing Rock Road is cleared, which we are currently working on (not that I want to get off the island, as it’s a fab place here!). Luckily the hostel itself is okay, although we lost two windows from the hospital. Leaves and branches are piled up all over the place so it is an effort to go anywhere, but each day things are a bit better. Are we in the outback? The saddest thing is the bush – much of what is still standing has gone brown with the wind and salt spray and whole areas look like Aussie – i.e. dried open bush which is fine in Australia but not here! The vege gardens are decimated and I had just planted a whole lot of cauliflower etc. 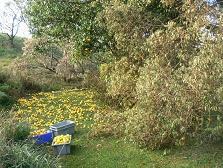 The lawns have gone yellow and look as if they have been sprayed with weed killer. Oh well, at least we were all okay. The early settlers had several storms as well as rats and goats to contend with. It must have been devastating for them as all their food supplies would be wiped out. Arkwright’s (named after the TV series which I think was called ‘Open all Hours’) is our food store and was undamaged so we can eat ourselves happy! About the meteorological side of things. The buildings here are owned by the Met Service and leased by DOC. We are contracted to do certain weather readings 365 days of the year and send up weather balloons. This is done by the DOC staff only (as a volunteer I don’t have to do this.) We have a roster for those doing this and also for “shutdown” (which I do), which consists of turning off the computers and putting them in a warmed cupboard as it gets very moist here, turning off the Met Service computer and doing the ‘sun card’. The sun card is a most fascinating piece. There is a structure with a big glass ball on top. Behind this ball is an area to put a piece of thick paper (the sun card) and each day the sun shines through this ball and burns the card. This is sent to the Met office whenever we can get mail to them which is probably about every six months. It is probably an out-of-date thing to do but I am no authority on this. There was one good thing that came out of the storm – I had been eyeing up the oranges at the top of the tree (why is it the best ones are always at the top?) wondering how to get them down. I have picked up nine fish bins of them since the storm with about 150 oranges per bin and the pukekos, ants and tuis are having a ball with the rest. Raoul Island oranges are famous for their juiciness and taste. They don’t look that great but they taste marvelous. I am making a bucket a day into juice – yum. 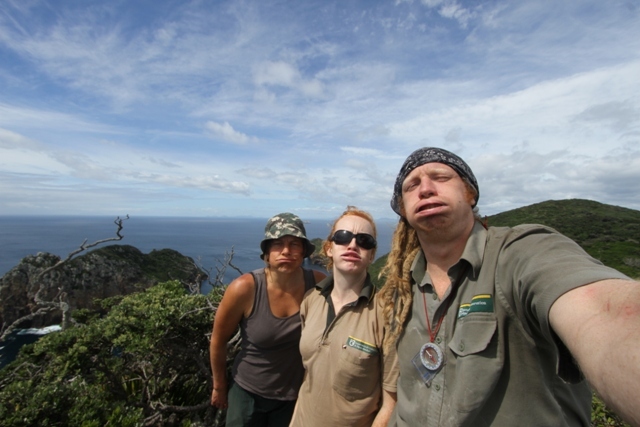 Well, this is but one of many experiences I am having on Raoul Island. It is an amazing place and I am having a ball here. Since the island is so remote, we get these diary entries from the team and post them up on their behalf. Today’s diary is by volunteer Helen Kay. Having been accepted in to the Raoul weed programme as a volunteer, I had a matter of days to organise a flight over to New Zealand from the UK. I knew living and working on a remote island such as Raoul would be different in every way from my usual lifestyle in a city in northern England and it has not disappointed. After spending a week packing gear and training at Warkworth, we departed for Raoul on the Braveheart. Three nights of large swells, the unending feeling of nausea and the constant dread of someone being sick near me certainly made the trip memorable. Dry land and the warm reception of the team lifted my spirits no end. Having amenities such as a fully equipped kitchen and bathrooms undoubtedly made it easy to settle quickly into island life. Having said that, there are numerous aspects to living here that are very different from back home; having to keep track of our food usage for example. We are currently left with one tin of mushrooms and are saving it for a recipe deemed worthy. Cooking here is fun, we have to use what’s available whether it be from Arkwright’s (our food store) or from one of the hostel vegetable gardens. Tinned peaches seem to make a common appearance in a lot of meals. Every week day we walk into the bush and search for alien plant species such as black passionfruit and peach. A large majority of the weeds we find are seedlings, but when you’re the person who happens upon that massive adolescent mysore thorn, it’s very satisfying. Competition does arise when it comes to weeding; it keeps us motivated on those more challenging days. Very little of Raoul is flat so many of our weeding days are spent traversing (slipping and sliding) across steep gullies and swathes of wind-fallen trees. Naturally this earns some people (including myself) an impressive repertoire of cuts and bruises as well as that well-deserved home brew at the end of the day. Weekends provide ample time to do what you want, whether it be walking over to Denham Bay or one of the other huts, relaxing around the hostel, or brewing beer in the Rat & Tui Brewery. When we’re able to, snorkelling is definitely one of my favourite past times on the island. It’s awesome living and working in a nature reserve. Being able to boat over to the Meyer Islets is extremely rewarding. Standing in a colony of Kermadec petrels with their tiny chicks or having a masked booby walk up to you completely unafraid are both amazing experiences. I’m really enjoying learning about the flora and fauna of Raoul, especially the birds. The one exception is the pukekos between four and seven in the morning when they’re at their loudest! All the new experiences here have impacted me positively in every way. We are half way through our six months here and there is still so much to see and do.